Vibrant. Intense. Memorable. 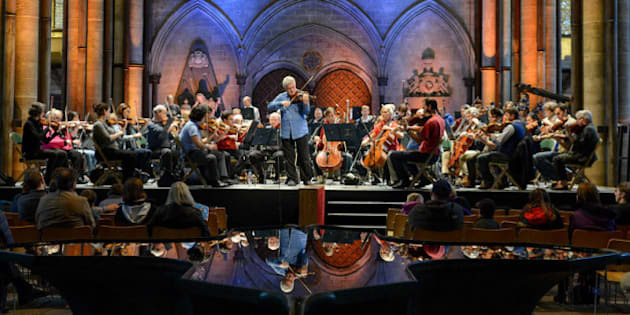 Those three words are forever etched in the minds of the thousands of concertgoers who were present Wednesday night at the Salisbury Cathedral for the penultimate performance by Ottawa's National Arts Center Orchestra (NAC) in its current tour of the United Kingdom. While touring overseas, in commemoration of the 100th anniversary of World War I, the orchestra made a stop in the city where Canadian soldiers were trained before being deployed on the battlefront. "In mid-October 1914, 31,000 Canadians arrived in Salisbury for training in the fields adjacent to the Cathedral. They had to endure one of the roughest winters in British History before going into battle in France," remembered Peter Herrndorf, president and chief executive officer of the National Arts Centre, one hundred years later while standing before flags of that era hanging from the walls of Salisbury Cathedral. For the past week, the orchestra's musicians have paid homage to those soldiers in Edinburgh, Nottingham and London. One last concert is planned in Bristol, on Thursday (Oct. 30th). As with any tour, this one had its fair share of fatigue, travel and adaptation. "The humidity level varies greatly from one city to the next, which affects the wood of our instruments, meaning that we have to tune them very frequently. I had to tune it again just 30 minutes before the concert because of the rain,” confided William Cravy, a 22-year-old American double bassist who is part of the NAC's Institute for orchestral studies. Every year, the Institute invites a handful of young musicians to spend a few weeks with the Orchestra’s seasoned players, including during this UK tour. The very setting of this penultimate concert imparted a singular aura to Wednesday night’s event. After stepping through a door embedded in an immense wooden wall, spectators found themselves on a car-free street where the Cathedral emerged from the fog. It was as if time itself had stopped. The concert opened with "Fantasia, a piece by British composer Ralph Vaughan Williams that immediately sent the public into a daydream. After moving the crowd with ease thanks to the piece’s dramatic flourishes, the orchestra gave the spotlight to Yosuke Kawasaki and Jethro Marks, concertmaster and principal viola, respectively, who played a dialog of solos imbued with emotion and finesse. The Cathedral’s exceptional acoustics were ideal for the compositions many intensity variation. Merely two days after their satisfying but far from transcendent performance in London alongside the Royal Philharmonic Orchestra, the members of the Canadian orchestra elevated their talent to new heights. The second part of the concert was devoted to a piece entitled Brio by composer John Estacio, a Canadian whose compositions are the most played around the world. Opening on a suspenseful note, it evolved into a barrage of crackling brass, flourishes of woodwinds, a mocking oboe solo, followed by a softer Segway into a sparkling finale. Despite the odd lack of coordination, the orchestra’s frenzied interpretation was lead by the indomitable energy of its maestro, Pinchas Zucherman. Renowned the world over for his talent on the violin, the orchestra’s director interpreted Max Bruch’s Violin Concerto No. 1, a piece that is ranked among the 4 greatest violin concertos of the 19th century, alongside masterpieces by Beethoven, Mendelssohn and Brahms. A true force of nature, Zucherman played solo and directed his orchestra during several passages. He interpreted the particularly difficult piece with an impressive panache, but with less emotion than his orchestra displayed before him. One must salute his courage for interpreting such a piece despite his bow being damaged during his performance, but one cannot ignore the impression that it was more impressive intellectually than emotionally. The evening concluded with Beethoven’s Symphony No. 7, a breezy, yet vibrantly humanist waltz, as well as British composer Edward Elgar’s Serenade for Strings, the orchestra’s very personal way of softly wishing the concertgoers good night. The anniversary of the First World War was also commemorated in Stonehenge, on the afternoon prior to the Salisbury Cathedral concert. A brass quintet from the NAC Orchestra played before a few dozen people who were in attendance at the standing stones monument, one of the most famous UNESCO World Heritage Sites. Nick Atkinson, Steven van Gulik, Karen Donnelly, Donald Renshaw and Jill Kirwan played Princess Patricia's Canadian Light Infantry, in honour of one of the three Regular Force infantry regiments of the Canadian Armed Forces, as well as The Maple Leaf Forever, the unofficial Canadian national anthem of the era. An impromptu meeting was organized between the nephew of A. A. Milne, the author of Winnie the Pooh’s adventures, and Lindsay Mattick, the great-granddaughter of Harry Colebourn, the Canadian soldier who owned the bear cub that inspired the author. "The BBC organized this surprise visit," explained the young woman from Toronto. “Milne’s nephew knew that Winnie had really existed, but he was unaware of the implication of Canada in this story. It was quite a special meeting. My visit to England is a lot more emotional than I expected.” Earlier in the day, she read, for the first time in public, a few passages from the illustrated book Finding Winnie, which will be published next year, to a handful of children gathered for the occasion at the Salisbury Cathedral.